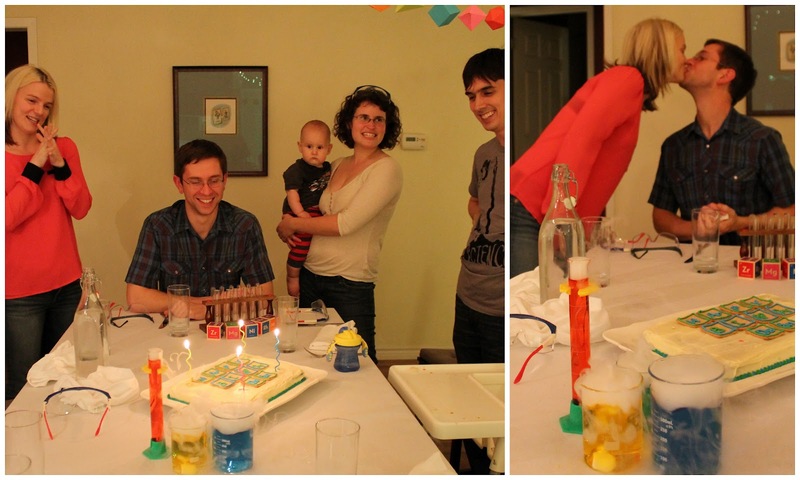 Dustin’s Molecular Gastronomy Birthday Party! 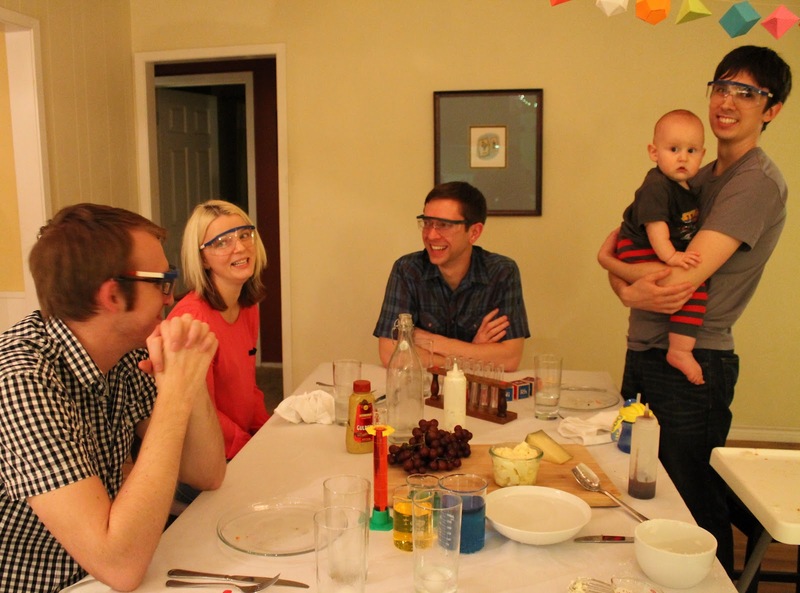 This is the final post in a series about planning a molecular gastronomy dinner party. These posts are also being featured on food52! This is it! 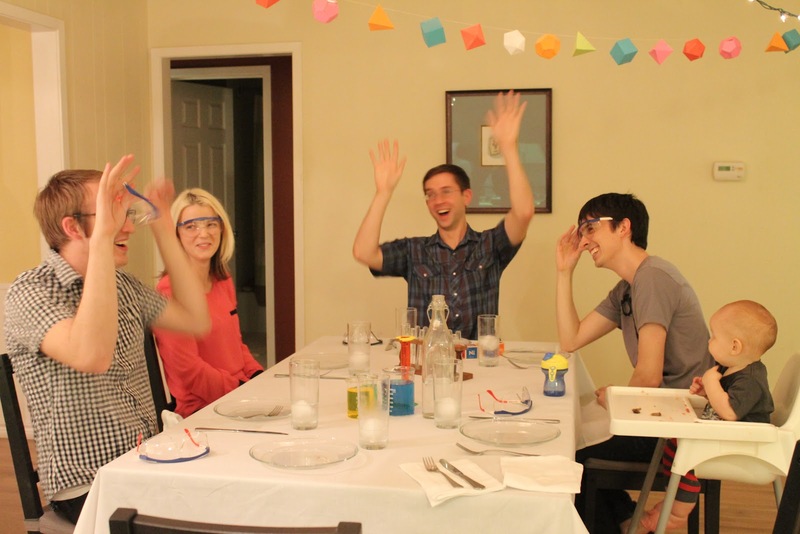 After weeks of planning, tons of shopping, and two solid days of cooking, it’s finally happening: Dustin’s Science!-themed surprise 30th birthday party! SURPRISE! Dustin thought he and Molly were coming over to babysit! 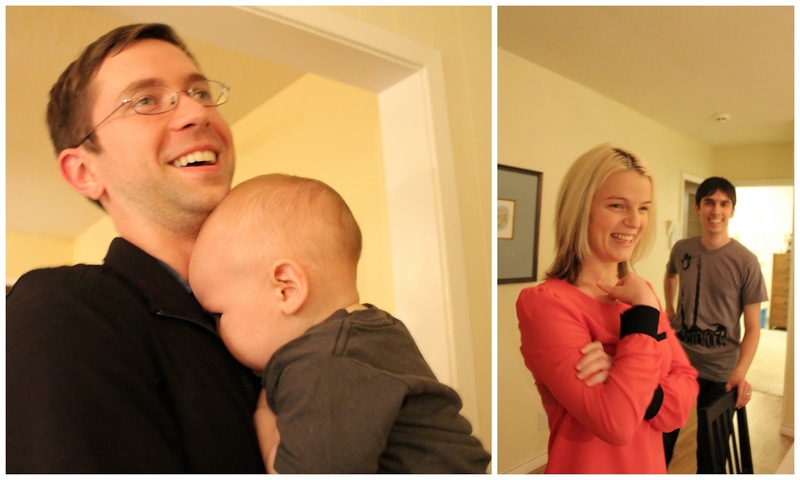 Henry didn’t care much for the surprise, but Dustin liked it! And he said he had no idea what we’d been up to! A toast! In test tubes, naturally. (They’re hard to fill on account of all the foam!) Now we can eat! 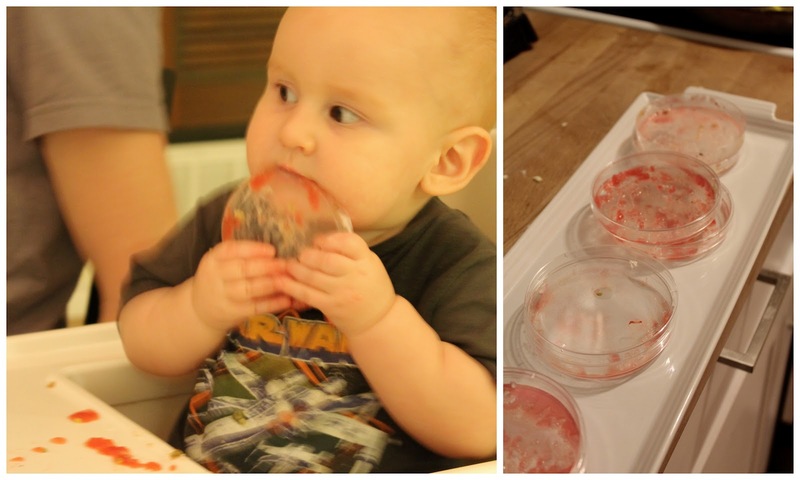 The first course: Petri Dish. 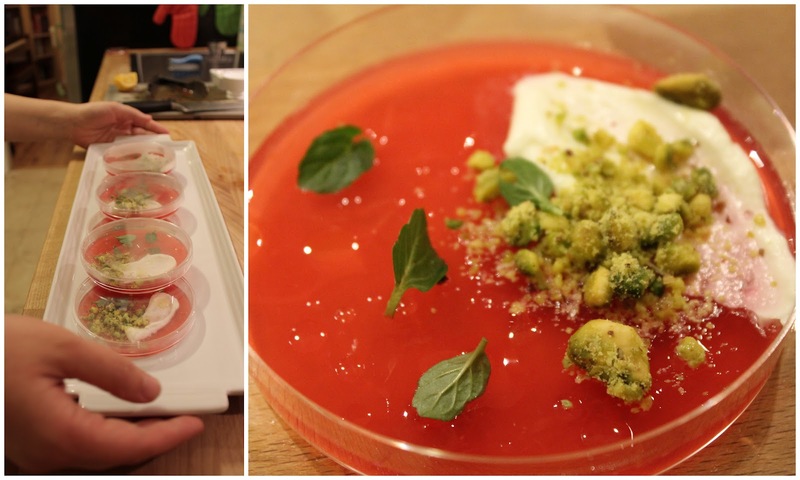 Blood orange gelée with a smear of local chevre, pulverized pistachios, droplets of meyer lemon juice and olive oil, micro peppermint leaves, and sea salt. It was a hit! Seriously- I’ve never seen Henry lick his plate before. The second course: Pipette. These turned out great! 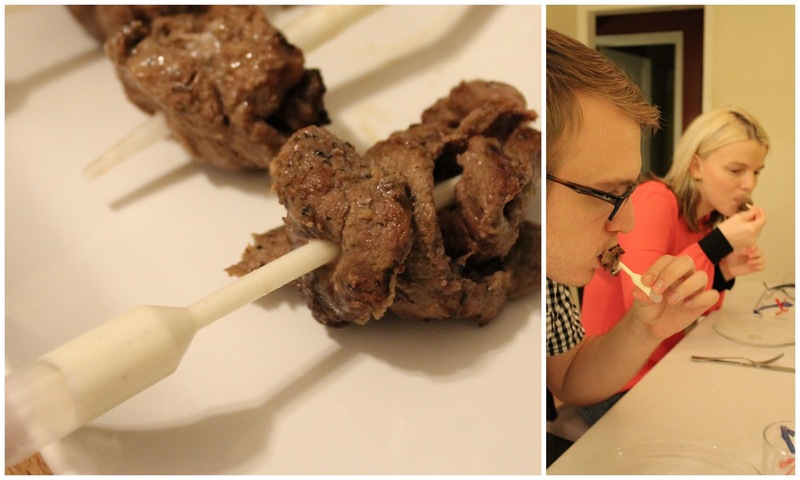 Oui, Chef’s herbed beef skewers are insanely good, and the horseradish cream in the pipette worked perfectly. 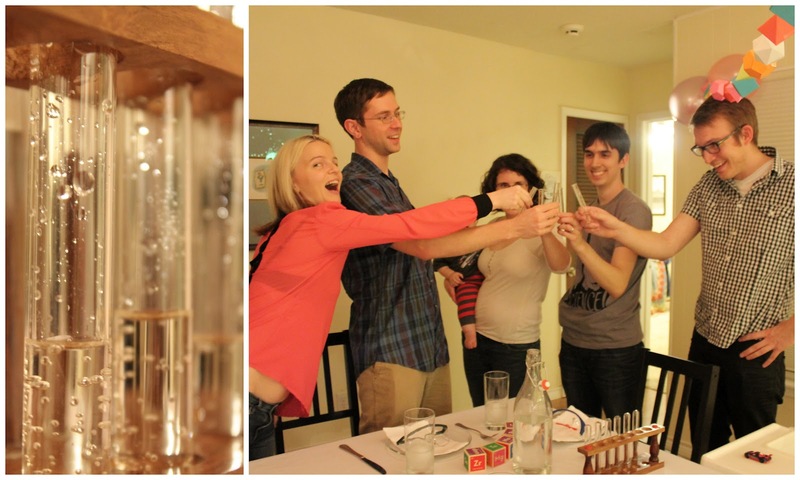 I don’t know if people are going to be rushing out to buy pipettes for skewers, but it is a totally fun concept. You get the perfect amount of sauce without having to worry about people double-dipping in a communal bowl. I kid! But really, I think this is a concept worth repeating. The third course: Pop Rocks. Korean Pork Belly Ssäm with pickled radish, short grain rice, and a sprinkling salt made with unflavored pop rocks, Japanese 7 spice, and sea salt. You guys! This was amazing. Probably one of the most delicious and fun things I’ve ever prepared. 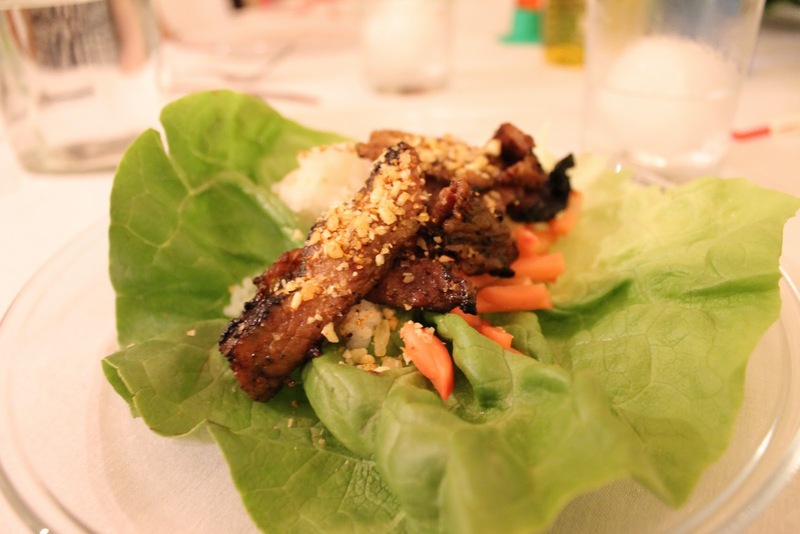 That pork belly is brilliant anyway, but the pop rocks were SO. FUN. The spicy-sweet salt on top really complemented the pork, and you could hear the pop rocks popping in everyone’s mouths around the table. It was a multi-sensory delight. I will definitely make it again- even if it’s just for dinner with Andy and Henry! Hooray! The first three courses were as good or better than I hoped they would be! Side note- I don’t know what’s happening in this picture, but I like it. The fourth course: Flea Circus. 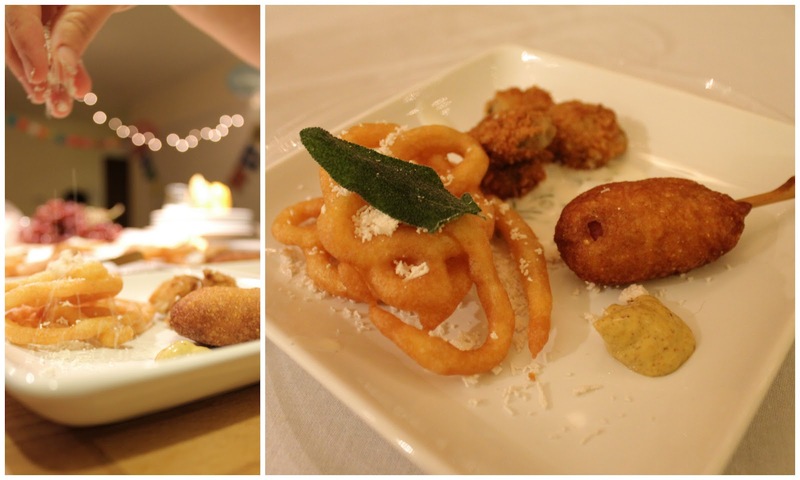 Miniature corn dog with spicy mustard, fried pickles with homemade buttermilk ranch, and funnel cake with sage and powdered bacon fat. The pickles and ranch were my favorite, with the cocktail sausage corn dog coming in a close second (I used Helen’s recipe for the batter). The funnel cake was good- the fried sage and bacon fat were amazing- but it lost its funnel cake-fluffiness during its hold time in the oven. It was still tasty, just much crispier than I had intended. I guess funnel cakes are best made à la minute! The fifth course: Cheese Plate. 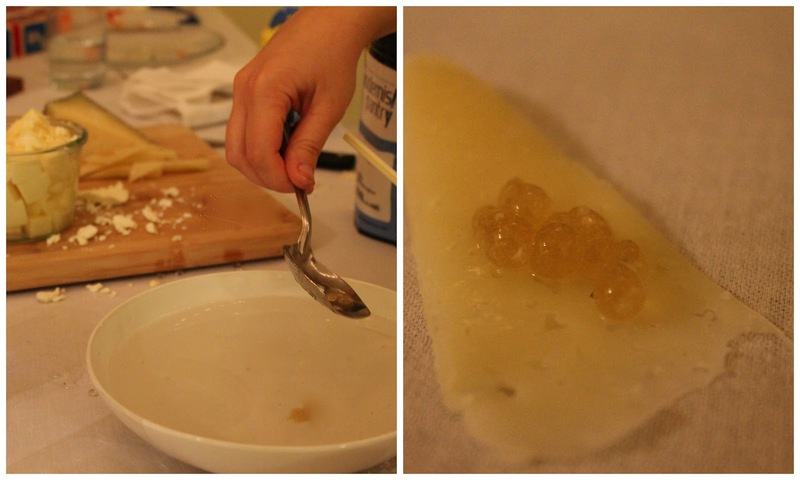 I had to make the honey spheres (for topping the Iberico) table side, so I decided to make the powdered olive oil, which had been infused with garlic, at the table too. That way everybody could see the science-y transformation. It worked! And it did so in spite of me completely abandoning the rigidly-precise spherification technique. I just watered down some honey, spooned in some sodium alginate, and mixed it up with a fork. The spheres were perfect orbs of liquid honey, encased in an ultra-thin membrane. So hooray for taking a shortcut and having it work out ok! Sad note about the carbonated grapes, though- they had lost their carbonation I just assumed they would stay effervescent, but they didn’t. If you’re planning to try out this technique, it should probably be done right before you’re planning to eat them- the grapes look really cool in the foggy bowl of dry ice anyway. 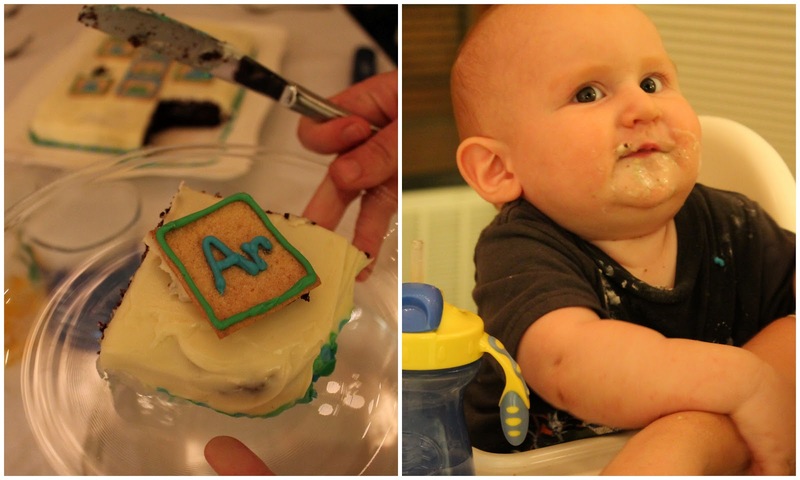 The sixth course: Periodic Table Cake. Molly made the cake, I decorated it, and we all devoured it. There’s just nothing like a moist chocolate cake with cream cheese icing. 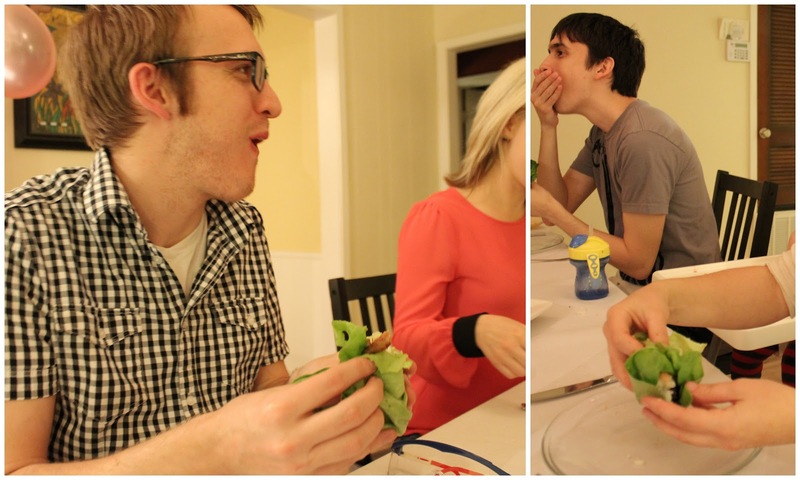 The final course: Miracle Berry. This course was my attempt to recreate the one Chris Jones created on Top Chef. 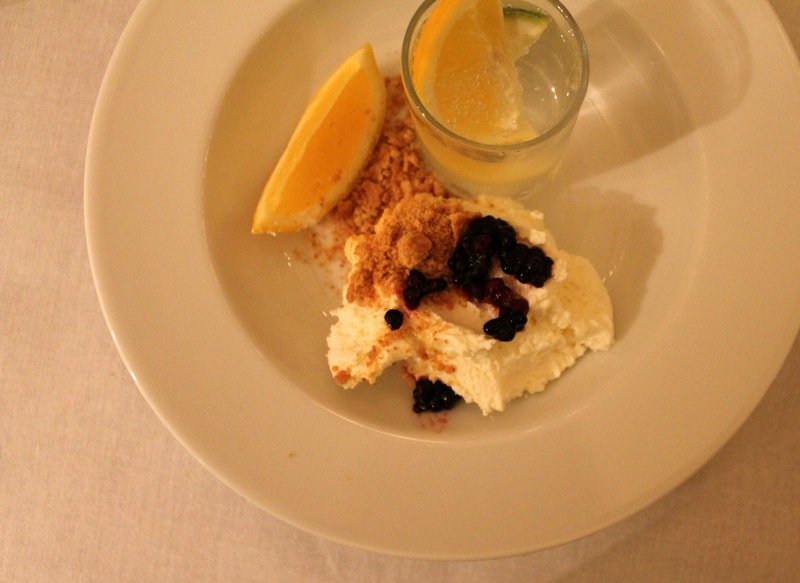 Slice of meyer lemon, deconstructed cheesecake (no sugar) with graham cracker crumbles and blackberry segments, and Pellegrino with lemon and lime. 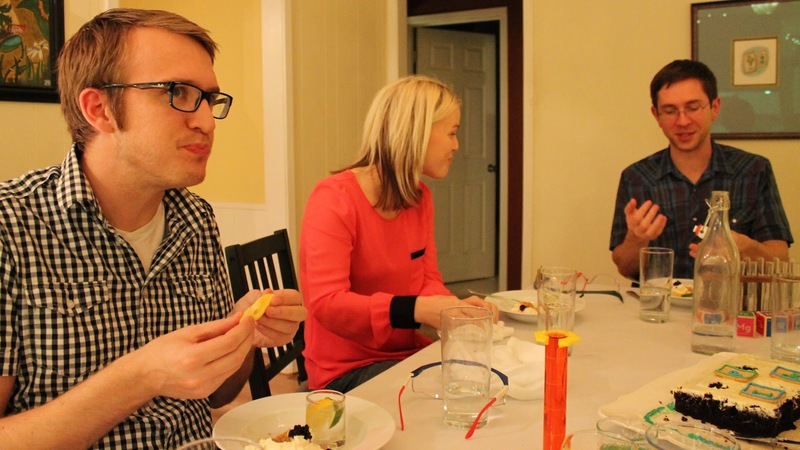 It had to be the last course because the effects of the miracle berry can last up to two hours. Oh boy was this fun! When I bought the miracle berry tablets, some of the reviewers said that they didn’t work, so I was a bit worried. But they were amazing! The lemon was like an intense and very sweet orange. The cheesecake, which was just cream cheese folded with whipped cream, vanilla, and lemon juice, was also delicious. And the Pellegrino reminded me of a cherry limeade. Honestly though, just tasting the lime from the Pellegrino glass might have been the tastiest thing on the plate- it was one of the most delicious pieces of fruit I’ve ever had. If you’re planning a miracle berry tasting party, make sure you’ve got a big sack of limes on hand! And that, friends, was the dinner. It was an absolute blast, and the birthday boy seemed to really enjoy it. Looking back on it, I am sure this is the most involved meal I’ve ever cooked, and definitely one of the very best. I was really happy that I spent so much time planning and thinking about the timeline. It was really great to have all the cooking done ahead of time so I could just plate the next course as soon as we had finished the last one. Huge, huge thanks to Helen, who is not pictured in any of the photos (sad face) because she tirelessly documented the whole process. No exaggeration- Helen took close to 1500 pictures over the course of two days! Thanks, Helen!! Hooray for Dustin and Molly! 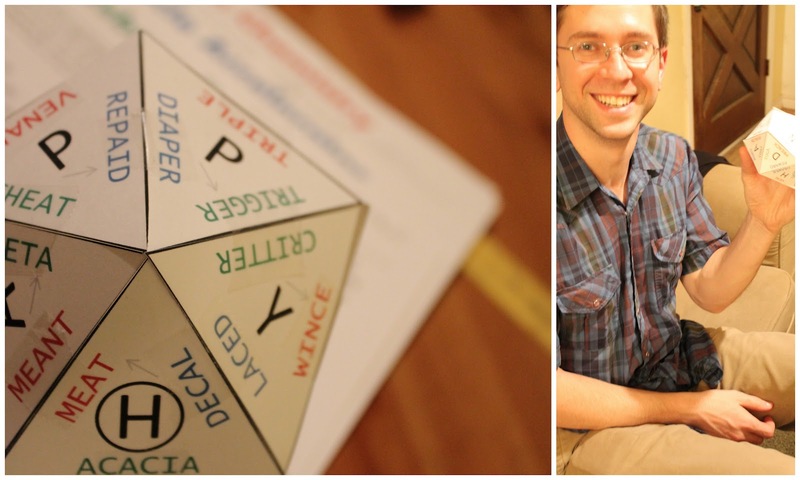 We were so happy to get to celebrate Dustin’s 30th birthday in such a grand fashion! I hope it was as fun for him as it was for me! If you’d like to see more, we’ve put up an album of our 300 favorite pictures. Thanks for reading! Wow! -You are teh awesome! How fun! 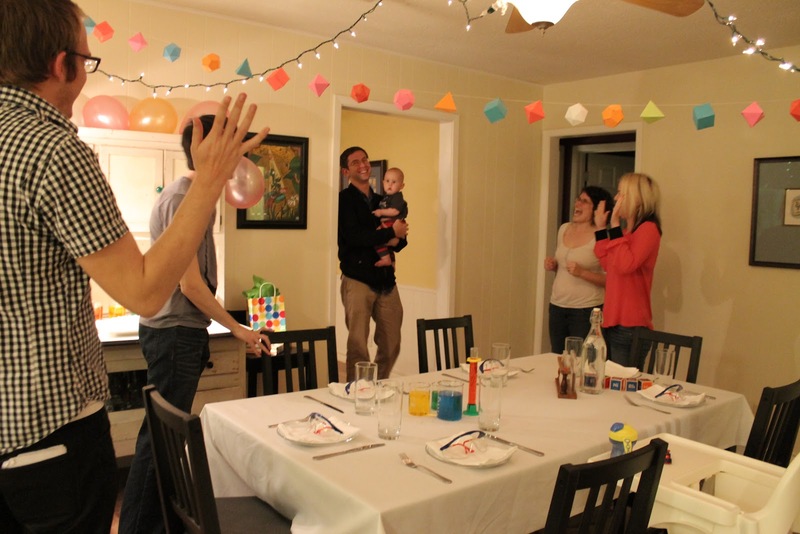 We come across a lot of kids birthday parties but none for adults. We love this and are sharing it on our Twitter feed @SteveSpangler.